February 20, 2018 by Ecommerce News. About Statistics with tags Sweden. 10266 views. Ecommerce in Sweden has increased by almost 16 percent last year. The online retail industry in this Scandinavian country was worth about 67 billion Swedish kronor, or 6.7 billion euros, which is just below the forecast of 67.7 billion kronor. Ecommerce now accounts for 8.7 percent of the total retail industry in Sweden. Thanks to digitalization, everything goes faster and meanwhile, online customers’ demands and expectations are increasing. For this year’s ecommerce revenue in Sweden, PostNord forecasts a growth of 15 percent. “At first glance, this may seem relatively low if you compare it with the growth of last year. But ecommerce is maturing every year.” If the forecasts are correct, ecommerce in Sweden will increase by 10 billion kronor to reach 77 billion (7.7 billion euros) at the end of this year. 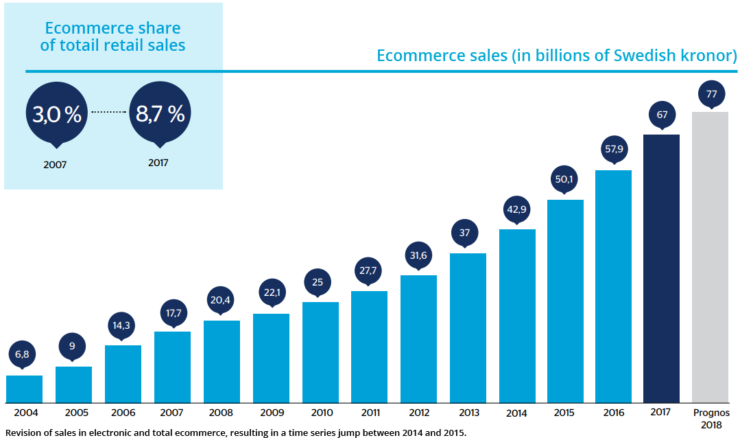 The development of ecommerce in Sweden. Consumer electronics is the product category with the highest online turnover: 1.39 billion euros. It’s followed by clothing & shoes (€1.03 billion), books & media (€430 million), DIY (€430 million), furniture (€300 million), sport & hobby (€270 million) and baby & toys (€210 million). Toys & baby products experienced the biggest percentage growth, this product category saw its online revenue increase by 23 percent last year. The DIY sector increased by 21 percent, while the food sector grew 19 percent.